By Nancy Young in People. Updated on April 9, 2018 . 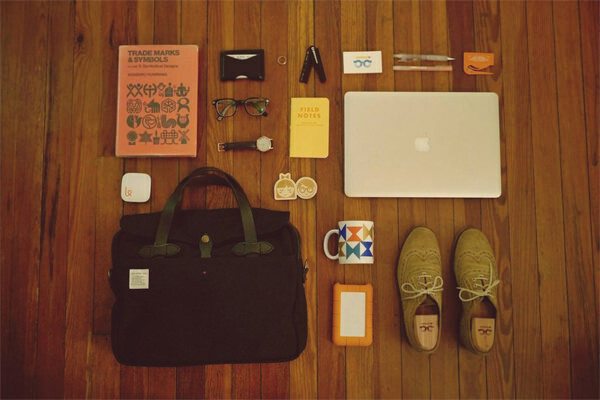 Designers and artists are pretty fashionable folks, as you may know. They like to get creative from the clothes they wear to how they organize their desks. 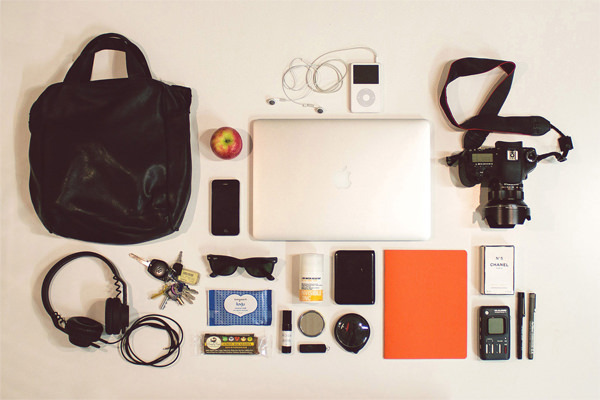 If you’ve always wondered about what designers carry in their bags as well, you definitely want to pay attention to this. 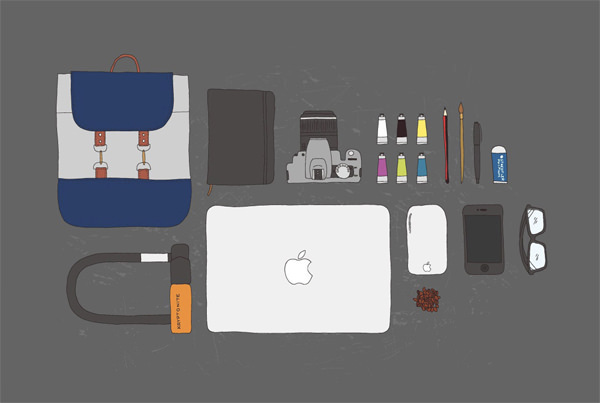 Mijlo, a Dutch-based collective which has a backpack project you can back on Kickstarter, has reached out to a group of creatives from all over the world, asking them the essentials they have in their bags. 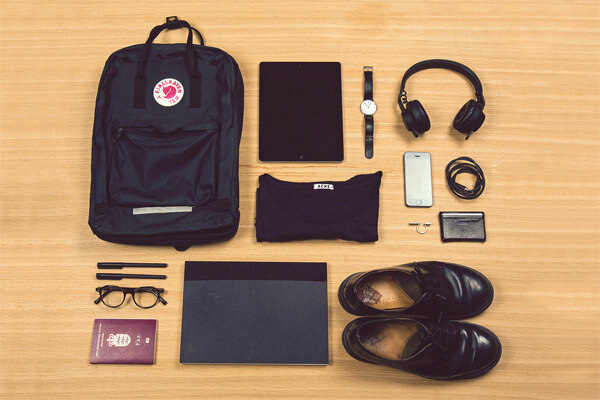 On their site you can find about 100 of these designer bag exposÃÂÃÂ©s, so what we have here is just a sneak peek into what you can probably find in a designer’s bag. Juani Lu is a designer, photographer and bookbinder from Toronto, who currently lives in Dubai. It is evident just how passionate she is about her craft with the particular items she uses for her craft like thread and the paper cutter. The camera, and a set of pens and markers in her bag complete her artistic endeavours. Fabrizio Querida is a designer at a graphic design bureau based in Barcelona called Querida (which means lover in Spanish). 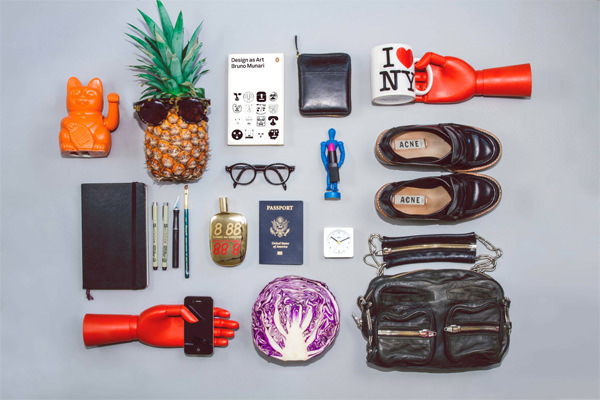 The array of things featured in the picture display a quirky sense of style as well as humor. The subtle nods to pop culture are pretty cool as well. Leta Sobierajski is a designer and Creative Director based in New York city, which explains the mug. What makes this display unique is the different combinations of item that seem to go together such as the radical pineapple with sunglasses and the lipstick holding figurine. Amanda Cole is a graphic designer and illustrator from Newcastle, Australia. She is also co-founder of the Shorthand design studio. 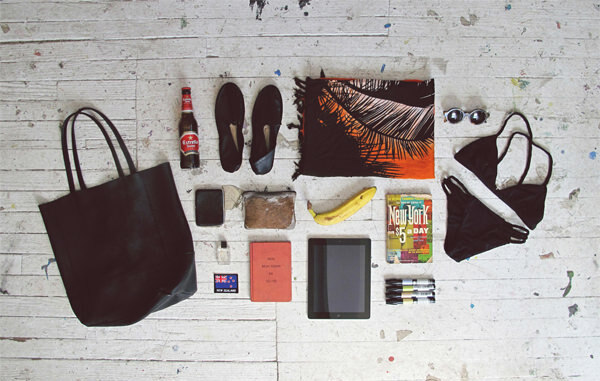 Instead of going the conventional route and taking a picture of her items, Amanda went with what she knew. You can really tell that she dials it back down to the real essentials. Justin Broadbent is an artist based in Canada. 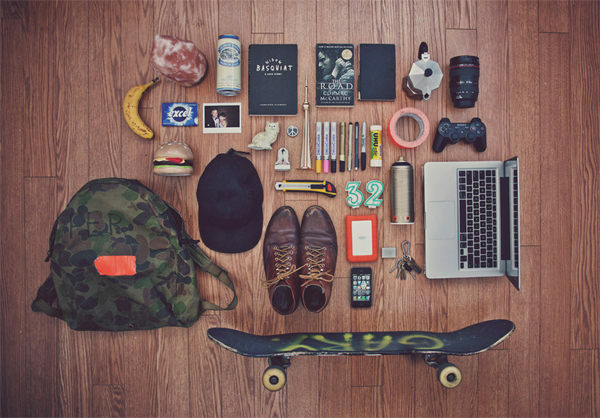 Judging by his collection of items military bag, Justin is a fan of coffee and skateboarding. It’s highly likely that he’s 32 years old and dabbles with different mediums of art. Jordan Blyth is the owner of a small design studio, JB Studio, that specializes in identity design and brand development. 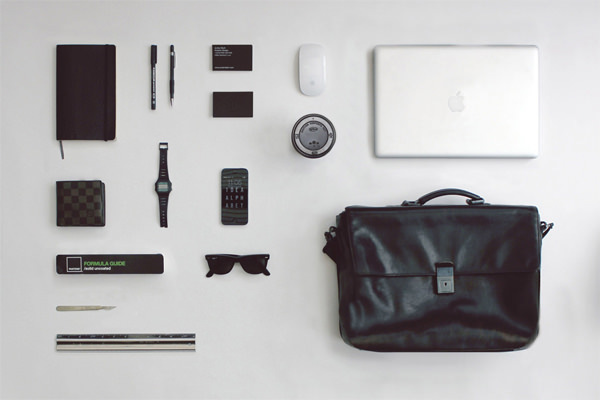 His fairly minimalistic style is depicted here by his choices which are black and white in color. Ed Nacional is a freelance designer and illustrator from Brooklyn, New York. As you see, Ed is a fan of trade marks and symbols. 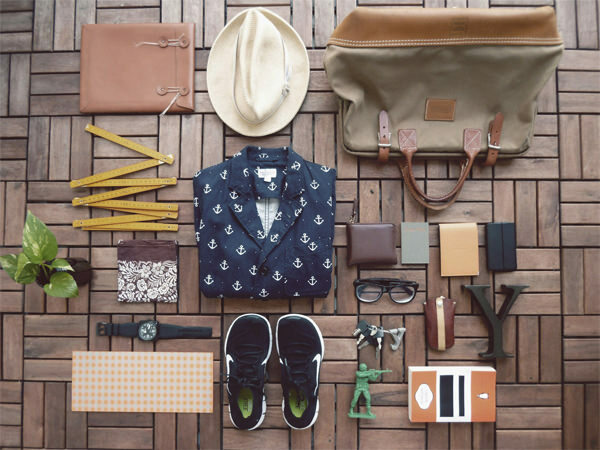 He also uses the stylish field notes notebook and only takes a few things along with him. 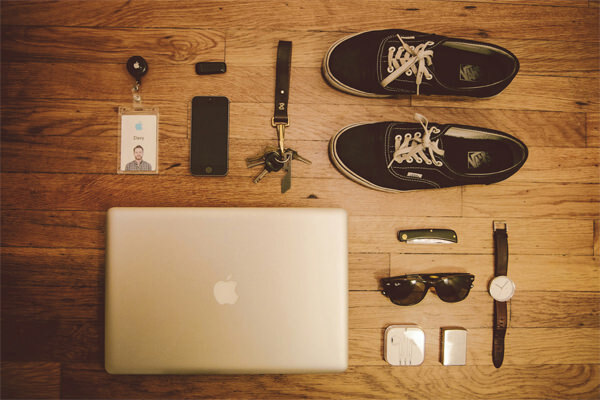 What really strikes a person about this photograph is the arrangement of the stuff Daniel has. 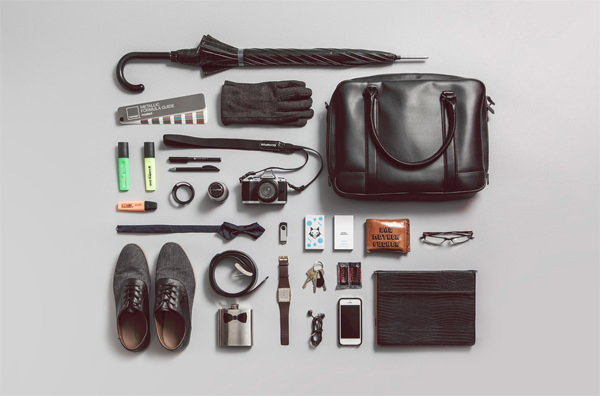 As a freelance graphic designer that also works in photography and illustration, the Norwegian has a particular elegant style that’s depicted by his accessories. 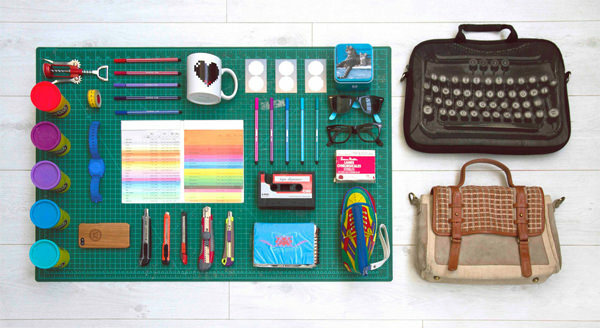 Kasia is a Melbourne based freelance graphic designer. She is inspired by various people like Wes Anderson and Saul Bass and loves to experiment with different creative elements. 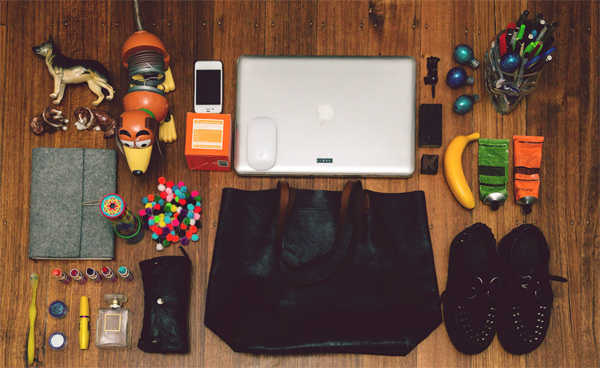 Her playful and creative nature comes alive through her things in this photo. Calen Knauf makes up half of the Knauf and Brown studio based in Vancouver, Canada. 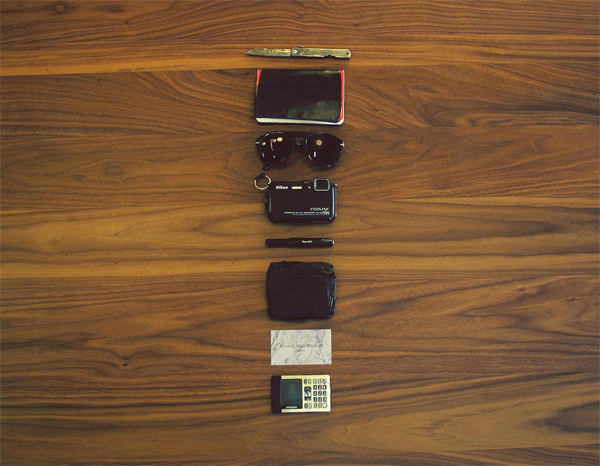 The contents of his bag are kind of weird: a pocket camera, notebook, sunglasses, a handy pocket knife and an old cell phone. 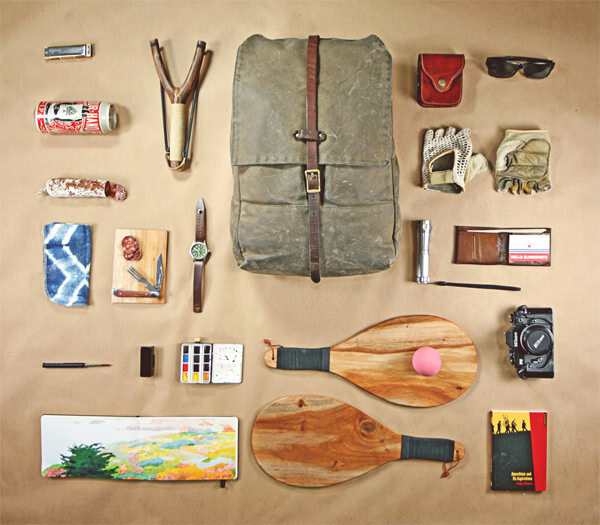 A quick glance at the contents inside the bag and you can tell that Adam Gray is someone who loves the outdoors. The artist from San Francisco has a huge imagination as indicated by his selection. Definitely someone with a wide range of interests. Polly uses photography, videos and sounds to reflect her view of the way human’s experience the world with all its features. 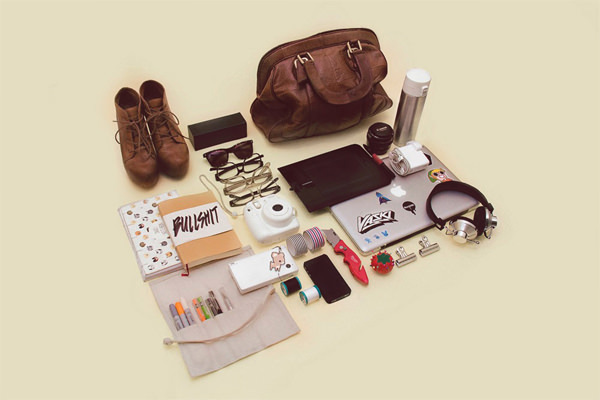 In addition to her art, she also works in film and television which is reflected in the items that she carries in her bag. Originally from Denmark, Thorbjorn Gudnason is a New York based designer. He has a fondness for creating ideas that combine both Scandanavian simplicity and New York mentality which we can see. 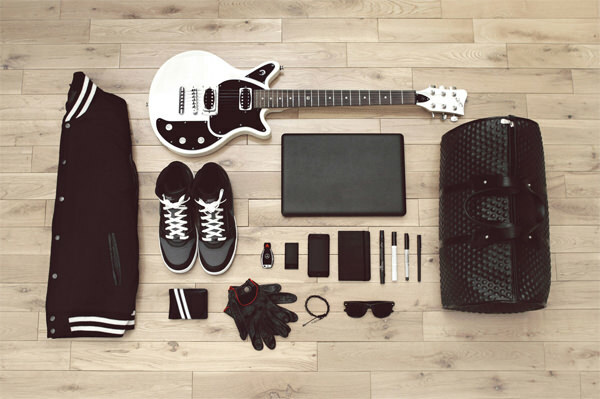 The contrast between his passport and the rest of his items which are black in color really highlight his taste. Levi van Veluw is a Dutchman who has produced varying artworks in a combination of different disciplines. 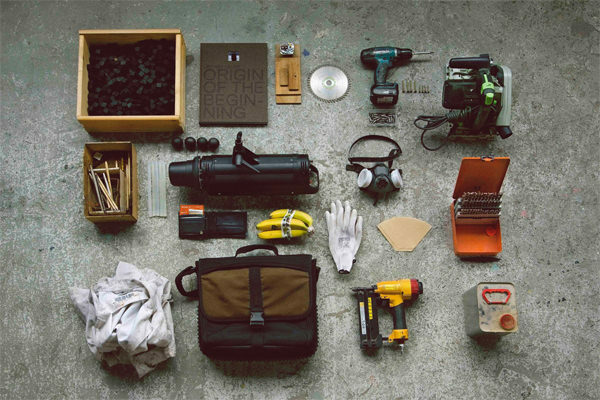 The powertools displayed here showcases just how much he plays around with all sorts of materials. French artist Thimbault Zimmermann is a part of the Zim&Zou brand. Their specialty lies in creating wonderful installations out of phsycial objects although their preferred medium is paper. Thimbault’s vibrant personality comes through below. 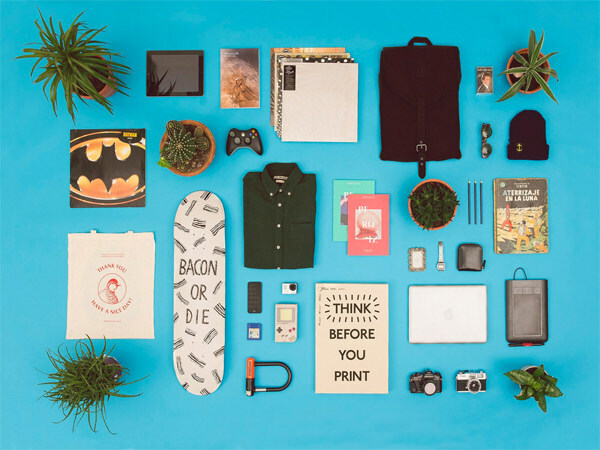 Joe Perez is a creative director and graphic artist based in Los Angeles, California. His clients consist of a lot of well-known musicians if you didn’t guess by the guitar and his general style. Yah-Leng Yu has worked with some renowned names in fashion. Currently she is one of the co-founder’s and a creative director at Foreign Policy Design, which is based in Singapore. You can sense the tropical vibe by the garments pictured below and the particular rustic sense of asthetic. Adriana is a founder and award-winning designer of Scene 360’s Illusion. Scene 360 is a magazine featuring art, design, and films. 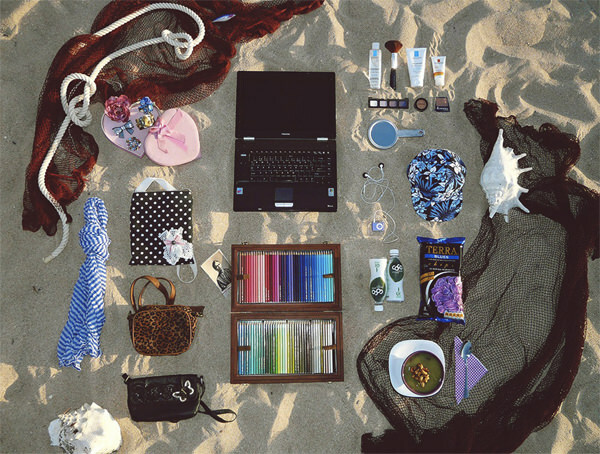 As one would expect, as someone who is in charge, she needs a lot of tools in her bags, be it make up or artistic tools. Amy Woodside is an artist and founder of OKREAL, a site which features stories of everyday women from all over the globe. Her own story unfolds her before our eyes. She comes across as down to earth and someone who appreicates the simple things in life. As the current Interactive Art Director at Apple, Davy Rudolph is someone who understands what the company is about. His Californian roots are showcased here in the form of the sunglasses and shoes. A fusion of elegance and simplicity. Share with us what you have in yours in the comments below.